Bosch is reliable. This is one of the reasons for the company’s success worldwide and in Ukraine. It is therefore not surprising that Bosch installed a Cat. 6A network from R&M in its new office in Kiev. 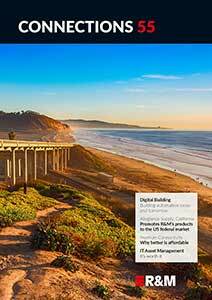 The Bosch Group offers innovations for a networked life. The IT infrastructure of the company has to be correspondingly modern which is why Bosch wanted a strong network with state-of-the-art Cat. 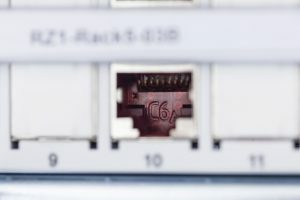 6A connectivity technology for its new representative site in Kiev. The LAN was to provide not only absolutely reliable data transmission with 10 Gigabit Ethernet as well as voice transmission. The goal was also to create a dense, secure and efficient WLAN compliant with the IEEE 802.11ac standard on the modern office floor. 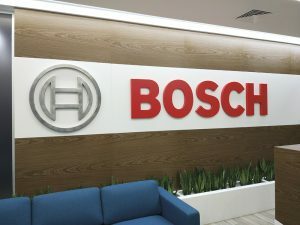 The office in the Silver Breeze Business Center on Pavla Tychyny Avenue fulfills a range of functions for the manifold business activities of Bosch in Ukraine. It facilitates productive open-space working, communication and presentation, management and relaxation. A project room, a classroom, conference rooms and the Board rooms make great demands of data transmission which means the LAN has to be able to be used in a number of ways. The welcoming lobby area, a lounge, a silence room, a fitness studio, a kitchen and coffee points are also part of the highly functional office. The company’s evaluation demonstrated that R&M could offer an efficient and above all reliable solution with its program for LAN applications, R&Mfreenet. The Cat. 6A ISO connection modules and patch cords in particular cut a convincing figure: These offer outstanding performance and considerable headroom for current and future data transmission. With R&Mfreenet, a LAN comprising 398 ports, 19 patch panels and 24 km Cat. 7 S/FTP installation cable was installed under great time pressure. Commercial Director Antonov Alexander confirms that tests show the excellent performance and significant characteristic reserve even in the case of short links. Bosch thus now has a powerful Cat. 6A network which represents a long-term basis for the office in Kiev. For Limont Stanislav, Director of installation partner Network Standard, the tight schedule was the greatest challenge. Using the Cat. 6A ISO modules from R&M with the corresponding special tools made installation fast and simple to complete.